EMBARK WITH YOUR GROUP. NO WORRIES! 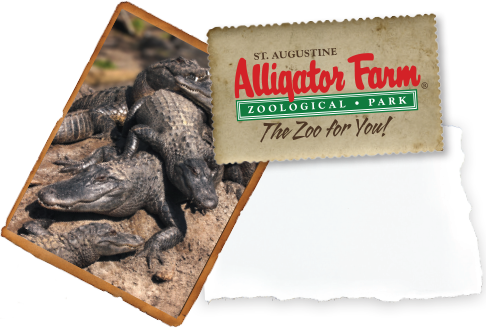 Before visiting The St. Augustine Alligator Farm Zoological Park, one of Florida’s original and finest attractions, familiarize yourself with these guidelines to ensure that your group’s visit is a worry-free success. ONE CHAPERONE ADMITTED FREE FOR EVERY 10 STUDENTS IN A GROUP. Additional chaperones must pay the quoted admission rate. When your group arrives, have one person check-in and pay at the ticket counter. The rest of the group will be admitted through the green gate just north of the main entrance. A SNACK BAR & PICNIC AREA ARE AVAILABLE FOR YOUR CONVENIENCE. Find the Kids’ Zone picnic area to the left of the snack bar as you enter. Coolers and bagged lunches may be kept in this area. However, this location is unsupervised; if you wish to keep your lunches on the bus, you can retrieve them when you are ready to eat. If the picnic area is not available at the time of your visit, we can suggest nearby parks in which to eat lunch. Please keep in mind that the snack bar seating area is reserved for snack bar customers only. No running or shouting inside The Alligator Farm, in the gift shop, or in our parking lot. We require at least one adult chaperone for every ten children. This is required for all school groups, from preschool through high school. Please keep your group silent during shows. Loud noises can endanger the animal handlers. Keep your group together and chaperone them throughout the park, in the restrooms, and in the gift shop. All animals can bite. Only feed animals from provided dispensers. The cost of food from the dispensers is 25 cents. Please ask your group to wash their hands after feeding the animals. No climbing in trees, on fences, etc. When the Wild Bird Rookery in the swamp is active, PLEASE do not disturb the nesting birds. Do not throw trash or other objects into the animal enclosures. Booked through tour bus companies only. Please schedule your organized group visit in advance. Please schedule your educational group visit in advance. *Bus drivers and one chaperone per ten children are admitted free. All other adults are charged the student rate. You must have at least 10 students to receive the educational rate. Children 18 months and younger are free.